Our gay blog pals at GLAAD have had quite enough of CNN employing hate group leaders and straight up bigots on their 24 hour talking heads newscycle. GLAAD and Change.org argue that CNN often plugs credential-less homophobes into their programming under the guise of providing “balanced” reporting on LGBT issues. The trouble with this sort of balance is that it’s not. There is no valid counterpoint against equality. You either support equal rights for all people, or you support discrimination. You can discriminate under the veil of religion, morality, the sanctity of marriage, protecting the children – but it’s still discrimination. GLAAD seeks to have CNN refrain from lending their soapbox out to the Maggie Gallaghers and Peter Spriggs of the world, hate leaders operating under the guise of official-sounding organizations like the National Organization for Marriage or Family Research Council. Please take a moment to fill out the quick petition below. 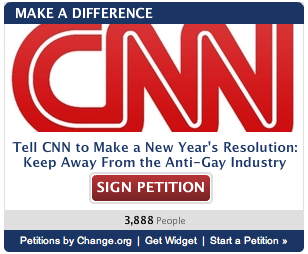 CNN, a world leader in news and credibility, is severely lacking in the handling of LGBT issues on air. This is an easy way to let them know we deserve and expect better.